Newsletters typically have single pages for the first and last page and two-page spreads for the rest of the pages. So when you delete a newsletter page, think about if you want to delete a two-page spread or just a single page. Right-click the page you want to remove and select Delete. 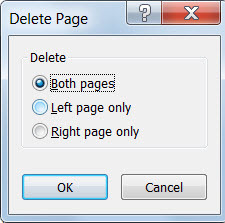 In the Delete Page dialog choose to which page or pages you want to remove.